The highest compliment I can offer any media creator is that his or her work made me feel something. Then made me think about it. The best books, games, etc. reach such a pinnacle by offering a vision of something new, or a new way to look at something. 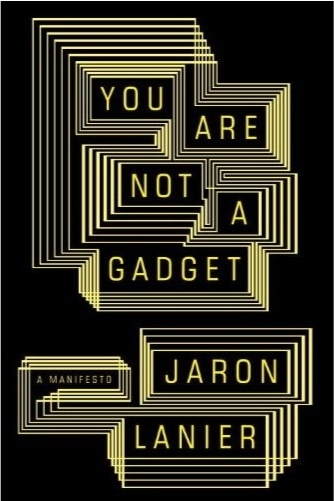 I don’t spend much time online discussing books (sorry, goodreads), but I make an exemption here to embrace You Are Not a Gadget. Living in the wake of Silicon Valley, the success stories of Google, Facebook, and Zynga surround us. I don’t question their successes. I’ve even quietly absorbed the elevation of advertising over other content, and even some stranger ideas of the Singularity and the Great Upload. Swimming in this idea pool informs the decisions of how I evaluate things, and how I develop games, including the one I am working on now. Carrying around such powerful beliefs without examining them is a bad idea. So consider this a note of thanks to Lanier for both terrifying me and inspiring. Jon, you kept me engrossed until I turned the last page, even if what you engendered was a fear of a future without a place for ideamakers. P.S. : The MIDI obsession is interesting, and I know you’re a musician, but let’s find some new metaphors for lock-in, eh? My wife and i got absolutely puacefel when Ervin managed to deal with his basic research while using the ideas he got through the web page. It’s not at all simplistic to simply happen to be freely giving procedures which some people might have been making money from. We do understand we’ve got the website owner to appreciate for that. The entire explanations you’ve made, the simple web site menu, the relationships you will assist to create it’s got mostly fabulous, and it’s really letting our son and us reckon that the matter is awesome, and that is exceedingly serious. Thanks for all!